Paper Tags suitable for Jeans Manufacturers available in a wide variety of Sizes, Textures. Custom Printed Paper Tags available in A wide Variety of Papers and Prints. Old Look Paper Tags to give a vintage, look, ideal for use in Denim Clothing. Crumpled Paper Tags made to give you a Old, Vintage and Rustic Look with Print. Being a renowned and the most popular enterprises in this industry, offering an optimum quality assortment ofJeans Tag to our customers with the support of our professionals. These products are made using finest quality components. Rectangular in shape, this Jeans Hanging Tag is made of premium quality raw material and has an updated look. Being front runners in the market, we are offering an admirable assortment of Vector Jeans Label. For certifying quality, these jeans tags are developed and designed by making use of topnotch grade material as per set industry norms and guidelines. 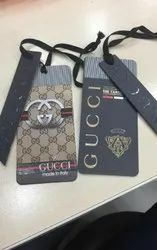 The Jeans Hang Tags are the descriptive elements of the clothes. These outstanding quality products provide information about price, size and other vital details of the jeans at a glance. Attached with a thread, these tags are invitee and attractive in looks. Furthermore, these are recognized among our clients for their colors and prints.